Back when I worked in the ER, we often would have patients come to the ER who were homeless or otherwise had not been taking care of themselves. Of particular concern was their feet—many had not removed their shoes for days or even weeks. When these shoes were removed, we often were confronted by a dreaded medical malady: Toxic Sock Syndrome. These feet could be unbelievably odiferous—I have seen hardened paramedics retch. So we had to be careful. If a patient was suspected of having Toxic Shock Syndrome, shoes and socks would be quickly removed into a plastic bag and the feet immediately washed and covered with clean slippers. That was about the end of ER involvement with poorly-cared-for feet. As an ER Doc, I never had to do much with the underlying foot disease. The medical term for such feet is PalmoPlantar Keratoderma or PPK. Of more interest to us are patients with “Acquired PPK.” The list of diseases that can be the underlying cause of grody feet includes diabetes, hypothyroidism, malnutrition, fungal infections, and autoimmune problems, like AIDS. It is important to think of this because many patients with grody feet have not yet been diagnosed. They commonly are the type of patients who do not have an outside doctor. Sometimes, being in jail is the first time they have had access to a functional health care system. Many, if not most, patients with grody feet need a work up. Also, as you might guess from the name PalmoPlantar keratoderma, many of these patients also have the same problem with the skin of their hands. If a patient comes to medical clinic with hands like this, be sure to look at their feet, too. The basic strategy for the treatment of PPK grody feet is to get rid of the clinging excess skin. It turns out that there are two ways of doing this. My favorite dermatology consultant (Thanks Neelie!) recommends slathering the feet with 20% urea cream once or twice a day. This works very well in my experience. My favorite podiatry consultant (thanks Dr. Cooper!) prefers to use instead Ammonium lactate 12%, again applied BID. Either one works well. Ammonium lactate is a little cheaper but neither are expensive. I have had such heel cracks myself, and they hurt, I can tell you. Complaints about heel cracks turn up frequently in correctional medicine clinics. According to Neelie and Dr. Cooper, you can use 20% urea or 12% ammonium lactate for these as well. The only difference is that you will want to add an occlusive dressing after applying the urea. In the “real world,” a piece of plastic wrap even held in place with a sock or ACE wrap works great as an occlusive dressing. Saran Wrap, though, isn’t an option in most correctional facilities. Another option, though, that you can use for deep heel cracks is cyanoacrylate, better known as super glue and marketed medically as Dermabond. Cyanoacrylate is how I have treated my own heel cracks as well as similar painful cracks on my fingertips and even deeper abrasions on my palms. It works very well! Here are two references to give some legitimacy to this longstanding trick-of-the-trade: Superglue for the treatment of heel fissures and A review of cyanoacrylate liquid skin protectant and its efficacy on pedal fissures. This second article even has pictures showing how to apply the Dermabond (you probably don’t need the help. It’s pretty easy). Nasty, hyperkeratotic feet are a common sight in jails. 1. When you see them, think about underlying disease processes that can precipitate PPK, like malnourishment, diabetes, hypothyroidism and immunodeficiency. 2. Treat these feet with 20% urea or 12% ammonium lactate slathered on BID. 3. You can also use 20% urea or 12% ammonium lactate for deep heel fissures. 4. An alternative therapy for heel fissures is cyanoacrylate liquid. 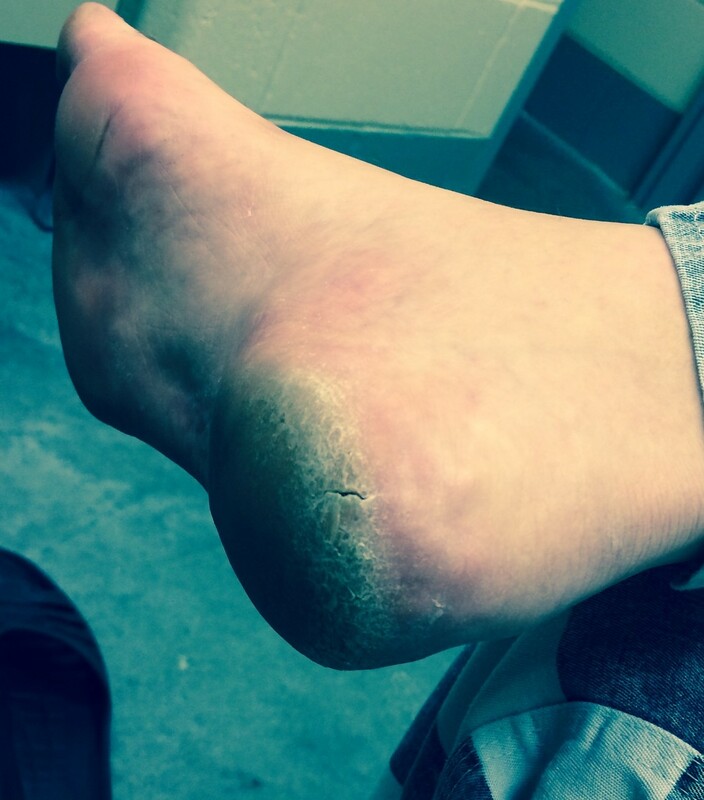 Do you have experience with Grody feet in your facility? Please comment. This entry was posted in Dermatology, Diabetes, Medical Practice and tagged correctional medicine, evidence based medicine, inmates, jail medicine, jails, Palmoplantar keratoderma, prisons on November 17, 2014 by Jeffrey Keller MD. I have found that having the patient scrub them daily to remove loose skin, then applying A&D ointment works WONDERS. But I love the idea of using the superglue on the fissures. Thanks! Topical applications of A & D ointment can precipitate or worsen a fungus infection. Rarely (usually never) use an ointment between the toes as maceration with secondary bacterial infection is a danger. Urea can and does exfoliate tissue, so it should be used with caution in patients with PVD or DM for instance. Most hyperkeratotic fissures require careful evaluation as to depth of involvement and usually require manual debridement. Giving incarcerated patients topical meds for their own use, predisposes them to modify the ordered regimen and use them excessively or wrongly, to their own detriment. Please refer all “Grody” feet to a Podiatrist, as not all clinical presentations require a “boilerplate” treatment. A Podiatrist with over 30 years correctional experience. We use a solution of Potassium Permanganate and warm water to soak their feet in. 2 tsp of powder in a plastic basin of water, soak for 20 minutes once per day for 7 days. It is amazing. It turns their feet an ugly brown color for a few weeks but it cures the fungus and works every time. The Potassium Permanganate only costs about $20.00 for a 5 pound jar and it will last you for the next 10 years. You can buy it from a chemical supply company. Our first jail doctor told us about it. He previously worked for a VA hospital and they used it to treat all the Viet Nam vets who had chronic foot fungus problems. We have been using it for over 20 years here and I have only purchased it twice. It works great. RN practicing in corrections. PPK mild-moderate, not an authorized treatable diagnosis for providers in my neighborhood. Casting about for suggestions for what I can do when problem seen in confinement sick call. From 40 years of personal experience, I use a Black and Decker sander with 80 grit paper and sand the callous thin and apply super glue to the deep fissure ( sand lightly after it drys) I do this weekly. Then apply any type of lotion, cream liberally and let it soak in for up to 30 min. Then put on socks. Lotion daily. I have had bleeding cracks since I was 15. This is the only way I have found to manage the condition. I have been to more dr.s and podiatrists than I can count. Interesting! I have an interesting mental visual of you concentrating on sanding your foot with the Black and Decker and a plume of smoke rising up. But unfortunately, it is not a practical solution for use in a jail. I have never used a dremmel myself on hyperkeratotic skin. I have used the dremmel tool on thick, heaped up toenails that are too thick for nail clippers.